An elegant sapphire ring bestowed with the quality standards of Kaisilver. The RG237 diamond and sapphire ring can be ordered with a tapering band width or, as a traditional band with a uniform band width all around the ring. As envisioned by our experts, this ring was to deliver a quality that is suitable for casual of formal wear. Most couples looking for a sapphire diamond engagement ring would expect to pay a lot more for their special ring. However if you ignore the moderate price tag of the RG237 ring and instead evaluate the features of the jewel, you will agree that it lacks nothing. Both sapphires and diamonds are sturdy gems, the jewel is crafted with a good gold weight with no scooping done inside the band. Expert artisans provide complete attention to every aspect of production, the result is a fine jewel that you will be proud to wear and own. Wear the sapphire diamond ring to office each day, keep it for that special day and slip it on as an engagement ring or let it mark the celebration of a birthday or anniversary, this ring will never look out of place. Any jewelry collection that is being built based on quality, style and value, should include this gorgeous ring. The good thing about the sapphire gold ring is that it is fully custom made, features can therefore be modified to accommodate your preference. The ring is shown with a tapering band width, the sapphires and diamonds are encrusted in the front half of the ring. Here are a few interesting variations that you could consider. 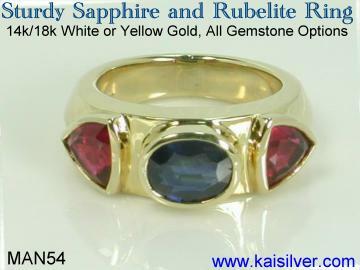 The RG237 sapphire gemstone ring is shown here with a tapering band width. The sapphires and diamonds are set in the front half of the ring. You could request for a sapphire band ring with uniform band width all around. The sapphire band ring can be ordered with diamonds and gems all around the band. We offer options for blue, white, pink, green, yellow or orange sapphire gems. Different sapphire gemstone colors can be combined in a single ring. The ring is crafted in gold and sterling silver with good workmanship and handpicked gems. 3mm (5pcs) round sapphires and 1.5mm (8 pcs) diamonds are studded in the front half of the ring. The ring is shown with a tapering band but, you can request for a uniform band width. The diamonds and gems can be set all around a sapphire band ring, request for pricing. You can order the gold or 925 silver ring with blue, white, pink, green, yellow or orange sapphires. 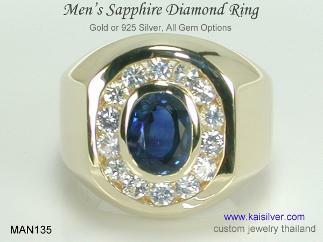 All Kaisilver sapphire rings are encrusted with natural heated sapphire gemstones. The sapphire gold ring is available in 14k or 18k yellow, white or pink gold. Certain traditional attributes of sapphire make it perfect for a wedding or engagement ring. This gem has since ancient times, been associated with truth, loyalty and sincerity. Diamonds are known for their hardness, something that actually gives an objective sense to the saying that 'diamonds are forever'. A sapphire and diamond engagement ring symbolizes a relationship that, is based on mutual trust and loyalty. The RG237 gold or 925 silver ring delivers a jewel that looks good and is also, designed and configured to withstand prolonged wear. The possibility of various sapphire colors along with the choice of three gold colors, further enhances the beauty of this gorgeous sapphire gemstone ring. If you read the interesting variations that could be selected for this ring, you will surely find a way to personalize the ring to better reflect your individuality and style. And if you wear this jewel as a sapphire engagement ring, pairing it with a simple wedding band later on would be quite effortless. 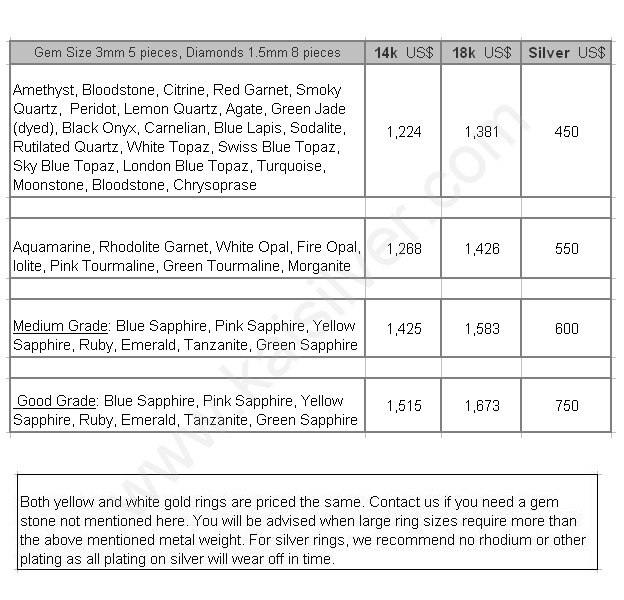 How To Buy: At Kaisilver we wish to ensure that you have all the information before placing an order. We encourage you to discuss details of your requirements with our expert team at sales@kaisilver.com You can ask as many questions as you want, make sure that you have all your doubts cleared and questions answered. Request the support experts to call you on the phone at a time convenient to you. It is best to put all details in your email, this allows us to get relevant information and select the best expert to call you. Payments are accepted through Paypal and Western Union, we recommend Paypal for first time buyers. Let us know which mode of payment is convenient to you, we will provide details for the same. Production time is generally 4 to 6 weeks from the date of order confirmation and receipt of payment. Shipping will be done through FEDEX with web tracking, there is a 45 U.S$ shipping fee to any destination, we ship worldwide. An awesome choice for a sapphire engagement ring, the price tag for this expertly crafted ring will come as a welcome surprise to many of you ... more. Modern science has proved the centuries old belief that, sapphires are always blue to be wrong. 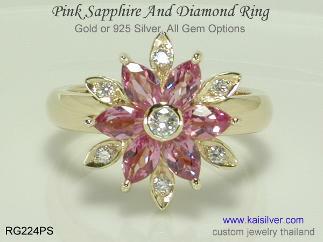 Here is a pretty pink sapphire gold or silver ring ... more. A majestic men's sapphire ring, crafted in 925 sterling silver or 14k / 18k gold. This diamond and sapphire ring is sturdy and durable ... more. Kaisilver: Regarded as the leading online source for high end custom made jewelry, we craft both sterling silver and gold jewelry based on equal quality standards. The same team of highly skilled artisans and gem experts works on both, gold and silver jewelry orders. We place no restrictions on your selection of design and gemstones. You can email us your queries including your own design images and sketches at sales@kaisilver.com Our team of gem and jewelry professionals will get back to you with detailed suggestions and price options. Choose any gemstone for the side gems in this ring, the center sapphire could be a white, yellow, green, blue, orange or pink sapphire gem ... more.